1. Premium Quality - High quality Elastic spring, high tensile strength, safe and durable. 2. Ergonomic - Widening and soft pedals, anti-slip handle, strong spring, well-fitting and comfortable. 3. Easy to Carry Out - Compact and portable. 4. Do Exercise Anytime Anywhere - Workout in home, office or even outdoors while watching TV, chatting with friends. 5. Shape Your Body Effectively - Workouts for Arms, Legs and Back, and can do seated exercises. Improve stretching and flexibility. 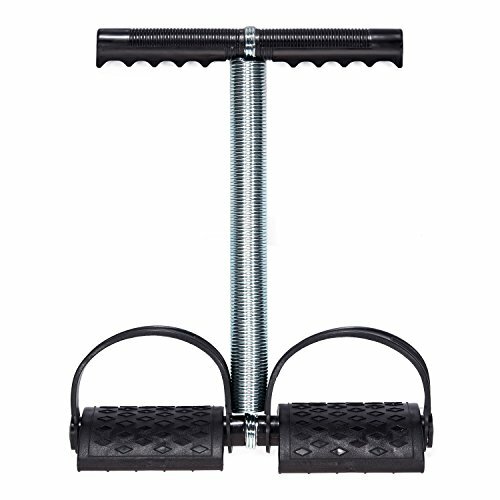 ★Durable & High Quality: Strong elastic spring, featured with widening contoured foot pedals & steel coil pull-up bar & high density anti-slip PU handle, nicely fit into your hands and around your feet. ★Abdomen, Arm & Chest Exercise: Both standing and sitting using are ok. Different using method for different exercise. abdomen, arm and chest exercise are all supported with this great fitness equipment. ★Lightweight & Portable: Portable and light weight, easy to store and can be used anywhere anytime though in office. ★Specification: Size: 11.8 inch x 10.2 inch (L x W), Weight: 742g, Portable; Material: Strong Spring + PU handle + Plastic foot pedals, great for crossfit ,yoga, fitness classes, physical exercise and recovery from injury. ★Seller Support & Warranty: We provide 24 hours online customer service, if there any problems, feel free to contact with us. Also, we provide 6 month return and refund warranty(NO human damaged). If you have any questions about this product by Lycheer, contact us by completing and submitting the form below. If you are looking for a specif part number, please include it with your message.